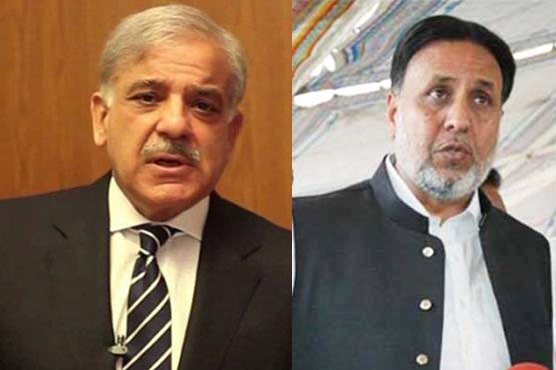 LAHORE: Opposition Leader in the Punjab Assembly and Pakistan Tehreek-e-Insaf (PTI) leader Mehmood-ur-Rashid called on Punjab Chief Minister Shehbaz Sharif on Friday to finalise the name of caretaker CM, but both leaders failed to reach a consensus. The meeting was held in Model Town where Speaker of Punjab Assembly Rana Muhammad Iqbal, Punjab Law Minister Rana Sana Ullah and Sibtain Khan were also present. According to sources, the opposition leader proposed the name of former chief secretary Kamran Rasool for the caretaker chief minister of Punjab. However, the two leaders failed to reach a consensus and did not make the final decision in this regard. The deadlock is still there despite the meeting and no breakthrough has been made as of yet. However, it has been learned that the name of caretaker Punjab CM will be announced by Monday as the two sides reached consensus on two names. The meeting was held in a cordial manner which lasted for half an hour. According to reliable sources, the leaders made a pledge in the meeting not to make any name public till the final decision on Monday. The two sides agreed on the point that if any name is made public, that name will be excluded from the list and no compromise will be made in this regard. The names of former director general of FIA Tariq Khosa and former chief secretary Dr Safdar Mehmood are making rounds on the PTI’s side. Talking to media after holding the meeting with Shehbaz Sharif, Rashid said he proposed two names for the caretaker CM while Shehbaz Sharif also proposed two names. He said consultation will be made until Monday, adding that he could not disclose the names at this stage. Shehbaz Sharif bought time till Monday to have a consultation with his party’s supreme leader and former prime minister Nawaz Sharif, sources said, adding that Rashid also sought time till Monday to have a consultation process with PTI Chairman Imran Khan. Responding to a query, Rashid said the first round of meeting remained inconclusive but hoped that the nation should be ready for a surprise. He further said that the opposition parties agreed on one name proposed by the ruling party while Shehbaz Sharif also liked one name proposed by the opposition. Earlier, the opposition leader held a meeting with parliamentary leaders of Pakistan Peoples Party’s Qazi Ahmed Saeed, Pakistan Muslim League-Quaid’s Waqas Hassan Mokal and Jamaat-e-Islami’s Syed Waseem Akhtar. Akhtar, on behalf of the JI, recommended three names for the caretaker chief minister of Punjab which included former chief justice of Lahore High Court Mian Allah Nawaz, and former federal secretaries Dr Safdar Mehmood and Khizer Hayat Gondal. Chief Minister Abdul Quddus Bizenjo and opposition leader in Balochistan Assembly Abdul Rahim Ziaratwal met in Quetta to discuss the caretaker setup in the province. During the meeting which lasted for two hours, the provincial government presented the names of Prince Ahmed Ali, Allauddin Marri, Nawabzada Saif Magsi, Hussain Baksh Bangalzai, Kamran Murtaza and Daud Khan Achakzai for the position of caretaker CM. On the other hand, the opposition forwarded names of Qazi Ashraf, Aslam Bhotani, Mallik Kansi, Fateh Khan Khajak, Ali Ahmed Kurd, Munawwar Mandukhel and Nawab Ghous Baksh Barozai. Speaking after the meeting CM Quddus Bizenjo said that the name of caretaker chief minister will be finalized within two days. Remarks of Sindh Chief Minister Syed Murad Ali Shah against the creation of a new province in Sindh have stirred a controversy and it is likely that the matter of naming a caretaker chief minister will be referred to the parliamentary committee, according to media reports. Earlier some broad understanding had been reached between the chief minister and Leader of the Opposition in the Sindh Assembly Khwaja Izharul Hasan on the names of Hamir Soomro, Justice (r) Ghulam Sarwar Korai and Dr Younis Soomro. The ruling Pakistan Tehreek-e-Insaf (PTI) and opposition leader Maulana Lutf-ur-Rehman were expected to finalise a consensus name for the caretaker chief minister for Khyber-Pakhtunkhwa, but the matter has been delayed, media reports said. The KP CM Pervez Khattak and opposition leader in the provincial assembly Maulana Lutf-ur-Rehman have so far held several meetings for agreeing on a name for the caretaker chief minister for KP. Some retired judges and bureaucrats are under consideration, according to reports.